This 45-minute lesson provides an opportunity to use ensemble prediction system products to evaluate uncertainty in the forecast and then communicate that information effectively to a public audience. The lesson places learners in the role of a Meteorological Service of Canada forecaster who must assess forecast uncertainty and then issue early warning notifications to decision-makers regarding the winter storm. In a subsequent work shift during the event, the learner must effectively deliver forecast information via social media and respond to questions from the general public. The lesson is intended for experienced forecasters knowledgeable about mid-latitude weather regimes, and is also suitable for the academic community. The interactive questions spread through the lesson were really helpful at maintaining my interest. 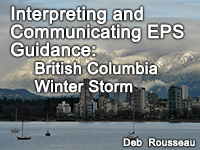 Good overview of Interpreting and Communicating EPS Guidance. Looking forward to more modules like this in the future!